For the first time, two all-day field trips were added to the rooster of choices for the VNPS Annual Meeting in order to allow more time for travel into places not readily accessible. A trip to Cypress Bridge involved boats. A trip to False Cape State Park today required a drive by tram through a Wildlife Refuge which is not open to cars. False Cape is the largest undeveloped maritime habitat on the Atlantic coast, and all of the plant communities in it are globally rare, so it made a highly interesting destination. 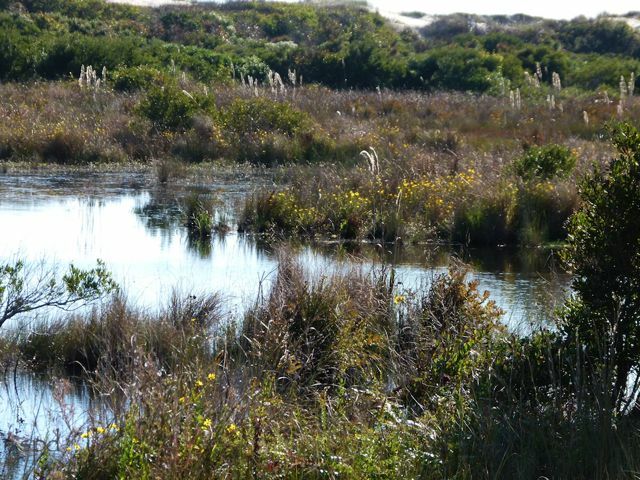 False Cape, situated between Back Bay and the Atlantic, must be reached by traveling through the Back Bay National Wildlife Refuge, which cannot be accessed by automobile. Back in the day, the Army Corps of Engineers took the bulldozer approach to impounding water there in an attempt to make more space available for overwintering birds. But by destroying the natural hydrology, and creating such disturbance, they also provided for the largest enclave of phragmites in Virginia – nine thousand acres.This kind of project would not be done today. In photo above are mostly native grasses and the blooms of Bidens laevis, smooth beggar tick. 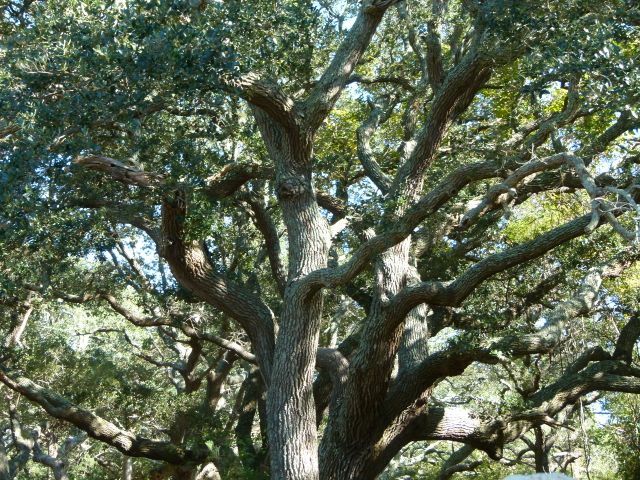 The first settlers would have seen land covered by stands of our native oak, Quercus virginiana. These mighty trees not only provided building material and firewood, but also food; the acorns could be eaten without any kind of processing. 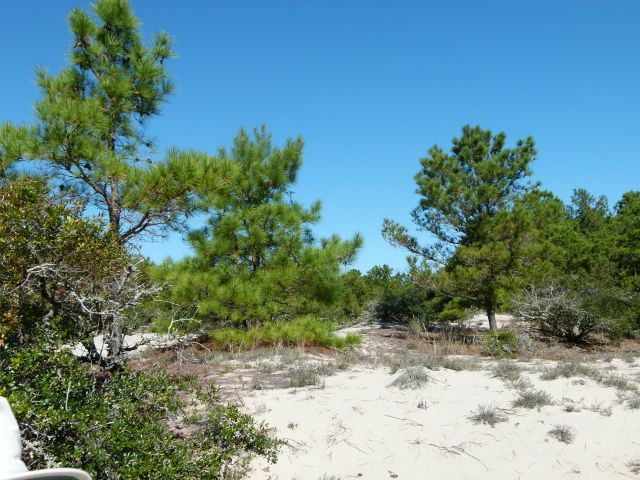 As the path continued on, closer to the ocean and just a couple of feet higher up, where wind-driven sand had raised the elevation, the closed maritime forests gave way to sand – loblolly pine community. 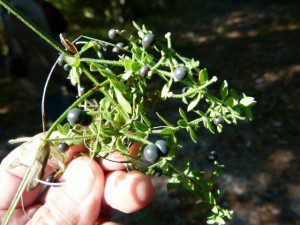 On the way through these places native plants both common and rare were encountered, from muscadine grapes and beautyberry to cracked-cap bolete mushrooms and maritime bedstraw. 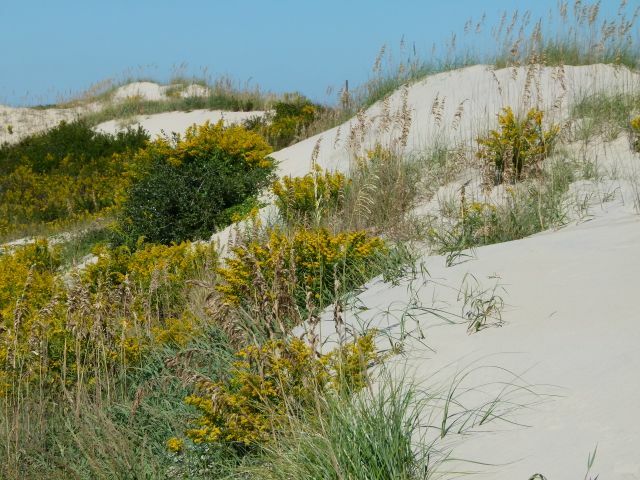 Neat recap of a day at False Cape State Park, and your images enhance the False Cape story. The habitat is important for birds, also, that were initially greatly responsible for lack of commercial enterprises in these maritime communities. Thanks, Nicky,the photos did not begin to do justice to the scenes. 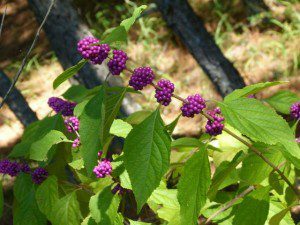 Looking forward to sharing more of the neat plants and the great insights into the ecology provided by trip leader, Gary Fleming. Such a treat to be in the company of a group of people so interested the subject.